No one likes a hypocrite, someone who pretends to be good, but is actually evil. and so most folks agree with our Gospel reading today telling us how Jesus had “a greater condemnation” for the hypocrites among the scribes. Today’s reading is a record of Jesus’ teaching in the temple during the week leading up to His crucifixion. The scribes He is talking about are the temple scribes. These are the ones who are actually in charge of copying the Holy Scriptures from one scroll onto another. They write the holy words of God over and over again and this repetition means that they know the Scriptures very, very well. They know the scriptures and yet use their great knowledge to rob widows. Jesus reserves His greatest condemnation for hypocrites because, by definition, hypocrites know better. You can’t fool others unless you already know how things work. Hypocrites know that what they are doing is wrong and yet they wear their consciences down to nothing and live a lie. Sadly, hypocrites lie to themselves more than anyone else. One day every hypocrite will stand before God in judgment and yet they don’t think about that day. Perhaps they have convinced themselves that there is no God and therefore no judgment. Perhaps they rationalize that their hypocrisy is justified and God will not hold them accountable for it. Perhaps they are hypocrites and don’t even realize it. Now, the first thing that I, as your pastor, must do is preach this sermon to myself. I am a hypocrite. I lie to myself. I lie to others. I even lie to God. When I hear Jesus condemn hypocrites, I need to understand that He is talking to me. I need to hear this sermon. You need to hear this sermon. How many times have you been a hypocrite since this service started? Earlier you said that you are by nature sinful and unclean. Did you really mean it? You said you deserved God’s present and eternal punishment. That means that you deserve a miserable life here on earth and eternal punishment in hell. Did you really mean it? Were you really sorry or just kind of half-hearted about your sorrow? Did you really repent, or just sort of repent? How much of the worship service have you done on auto-pilot while thinking about something else? What about the life you lead after the service is over. What are you like when you are alone? Does your attitude toward sin change when you don’t think you will get caught? Does the Word of God that you listen to in here actually guide the way you live out there? Many people criticize the church by noting that it is full of hypocrites. That is sort of dumb. It is like criticizing a hospital because it is full of sick people. An honest examination shows that all of us are hypocrites … and murderers and adulterers and thieves. I have broken all of the commandments and so have you. We are in desperate need of healing from our sin. We are not members of the church because we are so good or wonderful or righteous. We are members of the church because we are sinners who need forgiveness. We can get a hint for the source of the forgiveness that we need when we examine the second part of today’s Gospel. Here we encounter a widow who gives all she has. This woman may be one of the victims of the hypocrites that Jesus condemns. With this widow Jesus does something that only God can do. He looks into her heart and sees a faith that relies on the promises of God. This widow’s gift is a foreshadowing of the gift that Jesus will give a few days after this. This widow gives all she has financially. Jesus will give all that He has … period! Just as this poor widow offers her whole life at that offering box, so the Holy One who watches her, offers His whole life on the cross. Here is One who is never a hypocrite – who never does anything that deserves condemnation. Here is One who endures the greatest condemnation and makes payment for the sins of the world. When Jesus Christ suffers and then dies on the cross for us, He offers up His life as the perfect sacrifice that satisfies the justice of God. Because Jesus Christ lives a perfect life that is free of hypocrisy and every other sin, the grave cannot hold Him. Although His friends lay Him in the tomb on Friday, He rises from the dead on Sunday. He now lives forever and offers us a whole life. Through His sacrificial death and His triumphant resurrection He offers us forgiveness for all our sins including the sin of hypocrisy. And where there is forgiveness of sins, there is also life and salvation. 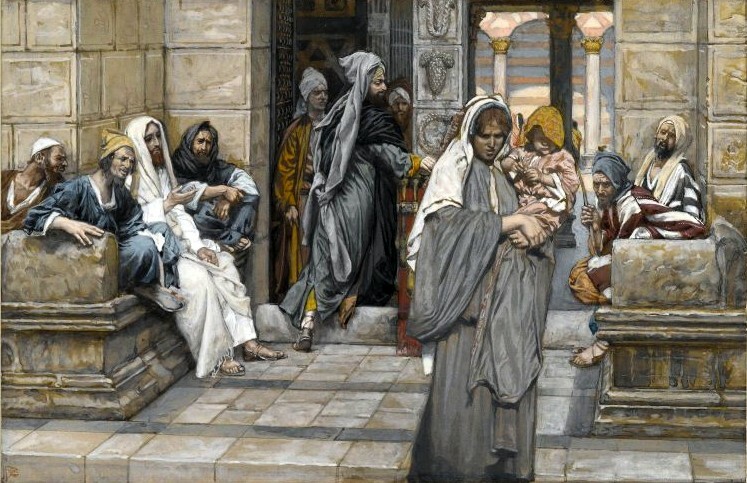 The Holy Spirit works through the Word of God to give us the same faith that the poor widow in today’s Gospel has. He works through the audible Word of God as we hear the readings and the absolution, and He works through the tangible Word of God that we eat and drink in the sacrament. The faith that the Holy Spirit gives us, receives the gifts that Jesus Christ earned for us as He gave His life for us. The faith that the Holy Spirit works in us through Word and Sacrament, gives us a share in the Kingdom of God. In that kingdom, we receive forgiveness, life, and salvation. The church is full of hypocrites because the world is full of hypocrites. Hypocrisy is but one aspect of the sin that plagues us all. As sinful human beings, we all want to reject God’s will for us … even if that will is the forgiveness of our sins. The world doesn’t understand that forgiveness is the true purpose of the church. Therefore, it does not see the real difference between the church and the world. The true difference between the world and the church is that the church is full of hypocrites who are forgiven. It is also full of thieves who are forgiven, liars who are forgiven, murderers who are forgiven, and adulterers who are forgiven. The church is full of sinners who are forgiven. The world does not understand this forgiveness and therefore sees no point to the church. Today we celebrate and thank God for the ministry of the Lutheran Women’s Missionary League which knows the point of the church. For 76 years the LWML has been supporting mission work nationally and internationally. The women truly are Lutheran Women in Mission, and they are also women of encouragement. The LWML hasn’t just been collecting pennies, nickels, dimes, and quarters in their mite boxes; they have also been encouraging women and men in their faith walk to find true rest in the forgiveness of Jesus. Over the 76 years of ministry, the LWML has lived through major challenges in our world and country, and even in their organization. Through all of the challenges and uncertainties, the LWML has placed their trust in God and have looked to Him for direction. Lives have been touched through their work and people have received rest that comes from our Lord and Savior, Jesus. Let us be encouraged in our own witness by the witness of the LWML. There are people all around us that struggle with insecurity in this fast-changing world. We have true rest to offer them in a God who loves them and gave His Son for them. Let’s live in this rest and share it with others because the day is coming when every person will leave this world behind. Those who leave without faith in Jesus Christ will leave without forgiveness. They will suffer the eternal condemnation that their hypocrisy and other sins have earned. Previous Article Boasting is the opposite of faith. Next Article Stand firm. Time is running out.